One of my teachers let me borrow this pedal and now I can’t let it go…more like I didn’t want to let it go but he needed it for a gig. He was telling me how this box made the mids sound better. I didn’t believe it until I heard it. I plugged my Ibanez SR-505 (with Bartolini pickups) and it turn my mediocre amp and cabinet into something twice its size. I was totally blown away. You can’t go wrong with this pedal. Buy this pedal f you want a bigger, brighter sound coming from your bass (especially if you don’t want to buy another bass). I found it at Guitar Center for $199. I used it recently and someone came up to me and said my skills were getting better. I had to flash the Tone Hammer box for further clarification. 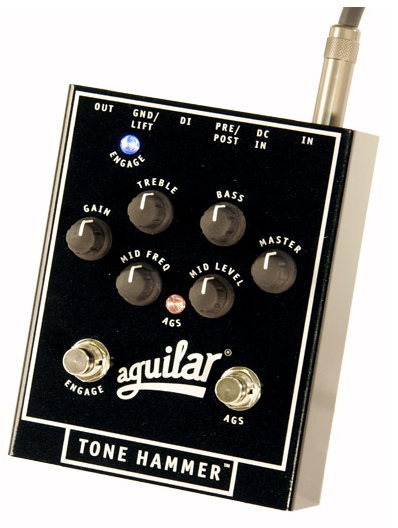 This preamp/direct box is so strong and powerful it could only be called the “Tone Hammer”! Based on the respected OBP-3 preamp, the Tone Hammer features fully sweepable midrange frequencies in addition to bass and treble controls. With the Tone Hammer’s pristine D.I. you are set for the studio or the stage. To give this tone shaping unit the ultimate flexibility we are introducing our proprietary Adaptive Gain Shaping circuitry (AGS). AGS allows the player to kick in an additional gain structure and EQ with the “stomp” of a button. You can now go from modern slap sounds to vintage or overdriven. 18 volt operation gives the Tone Hammer plenty of headroom to reproduce the most dynamic playing style. Separate “Gain” and “Master” controls allow you to dial in just the right gain structure for any instrument. 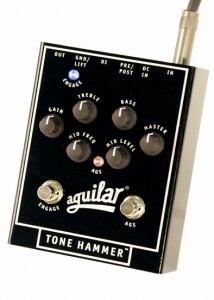 The Tone Hammer is the essential preamp/direct box for every bassist’s tool box. Oh, the AGS switch…that’s the button that boosts you up a notch when you want to go for those cool bass grooves. Enjoy!